Sarnia-Lambton Rebound has supported more than 40,000 youth and families since 1984. That is why so many people are proud to declare "I am Rebound". Rebound is a place that saves lives – like mine. My mentor became my hero and the programs gave me the confidence I needed to make life giving choices. For nearly thirty years Rebound has adapted to changing times, positively impacting thousands of young people along the way. I am amazed by it all. Seeing youth change and grow is a priceless reward. Rebound has given me the opportunity to serve my community and invest in its future. These are exciting times as we recognize the contributions that Rebound has made to Sarnia- Lambton since 1984. As our alumni success stories continue to fuel our commitment to be leaders in the field of prevention and early intervention, I am proud to say that I have witnessed first hand the fine work of our Volunteers, Staff and Board in helping youth reach their full potential. My hope is that you will join the Rebound movement and experience it for yourself! We invite you to take a few minutes and enjoy a little Rebound Awesome. 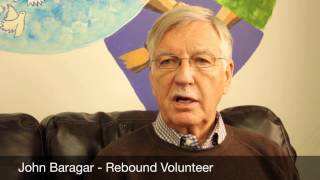 Our "I am Rebound" video gives you a look at what it's like inside the welcoming walls of Rebound.